The most recent Case Shiller home price data for the 20 cities tracked was released last week, and below we have updated a number of charts and tables that we’ve published on a regular basis over the years. The first table shows the month-over-month and year-over-year change in home price values across the country. After years of seeing all green in this table, we’ve seen a string of month-over-month declines recently. The composite 10-city and 20-city indices both fell 23 basis points in December, while the “National” index saw home prices dip 14 basis points. San Francisco saw the biggest month-over-month decline at -1.43%, followed by Chicago (-0.70%), San Diego (-0.69%), and Seattle (-0.63%). Seven of twenty cities saw small month-over-month gains, led by New York and Las Vegas at +0.17%. On a year-over-year basis, every city still posted home price gains, but those gains are getting smaller and smaller as the months progress. 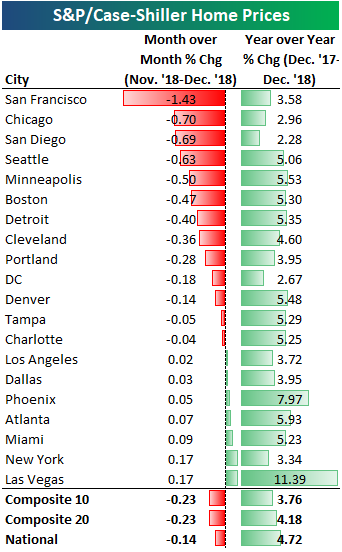 The chart below shows how much each city has seen home prices gain off of their housing crash lows that were put in sometime between 2010 and 2012 for most cities. San Francisco is up 128% off of its lows, while Las Vegas and Detroit are both up more than 100% as well. The National index is up 53% off of its low, while New York home prices have bounced the least at just 25%. The next chart shows where home prices stand for each city relative to their peak during the housing bubble of the mid-2000s.T he National index is up 11% from its prior all-time high that was made in July 2006. Denver prices have soared the most above their prior highs at +53%, followed by Dallas at +43%.On the flip side, Las Vegas is still the furthest below its housing bubble highs from the mid-2000s at -19%. Phoenix, Chicago, Miami, and Tampa are all still 10%+ below their prior highs as well. 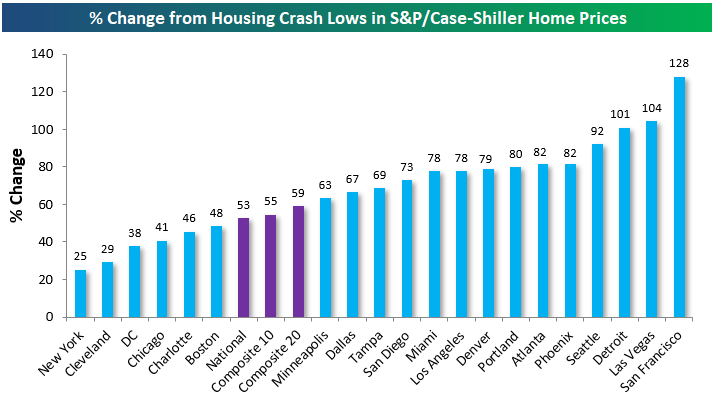 Below we provide charts showing home price levels over the last 30 years for the cities tracked by Case Shiller. 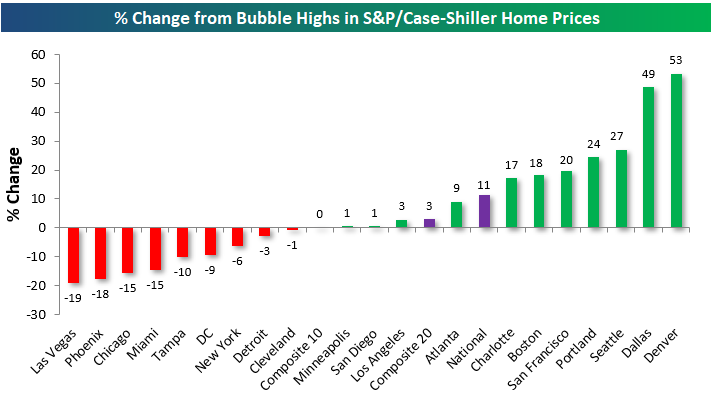 Cities highlighted in green have taken out their prior housing bubble highs, while cities not highlighted are still below their prior all-time highs.